"Always a hit! People will be wanting seconds. 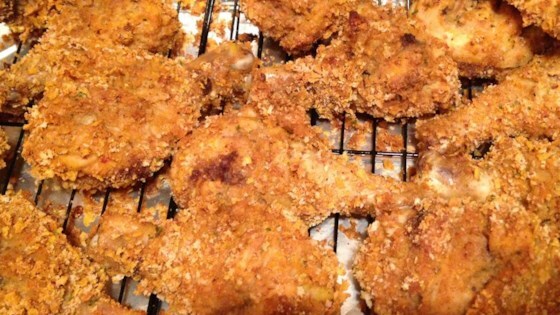 Crispy chicken that is made lower in fat, without being soggy. You may remove the skin from the chicken if you like. Serve with Cheese Mashed Potatoes." Preheat the oven to 350 degrees F (175 degrees C). Place a cooling rack on top of a large cookie sheet. Spray the rack with vegetable cooking spray. In a medium bowl, mix together sour cream and minced garlic. In another bowl, stir together the cornflake crumbs, rosemary, sage, garlic powder, salt and pepper. Coat the chicken with the sour cream mixture, then roll in the cornflake mixture. Arrange chicken pieces on top of the cooling rack. Bake for 1 hour in the preheated oven, until meat is no longer pink, and juices run clear. I liked this recipe but I would recommend adding the herbs and spices to the sour cream instead of the cornflake crumbs.